Tomorrow, a brave new world will open up for Magic: the Gathering players at their local gaming stores. 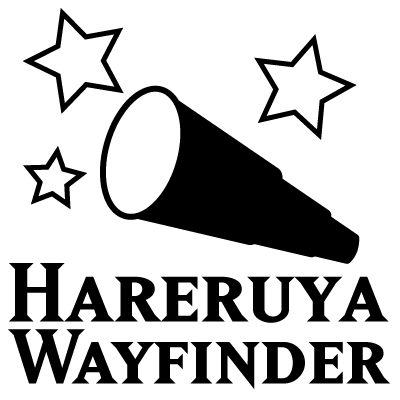 Like thousands of other gamers, we'll be dropping by our local store, OMG! Games, here in Barrie, Ontario to have a fun-filled Friday Night Magic evening. With the rotation of 2 blocks (four sets), the standard card pool just became a little bit smaller, but in our opinion, a whole lot more exciting. We have ordered the above list in line of which tribes are expected to be the most powerful in the new standard environment. Synergies and other tribal-based bonuses are great but may not be fully realised until the next set, Rivals of Ixalan produces additional support. For now however, the smart player (by way of example), may not be playing a tribal go-wide strategy with Orzhov (black / white) vampires but may be better served with a token-based strategy instead, utilising some of the new vampire spells which create tokens, such as Queen's Commission or Call to the Feast. There are some potential pitfalls of course. For example, playing a Mavren Fein, Dusk Apostle to create vampire tokens does force one to go 'all in' with vampire tribal, whereas it may be more prudent to look to previous black / white tokens lists prior to the rotation (some of which were not that bad), and simply update that with the goodies from Ixalan. 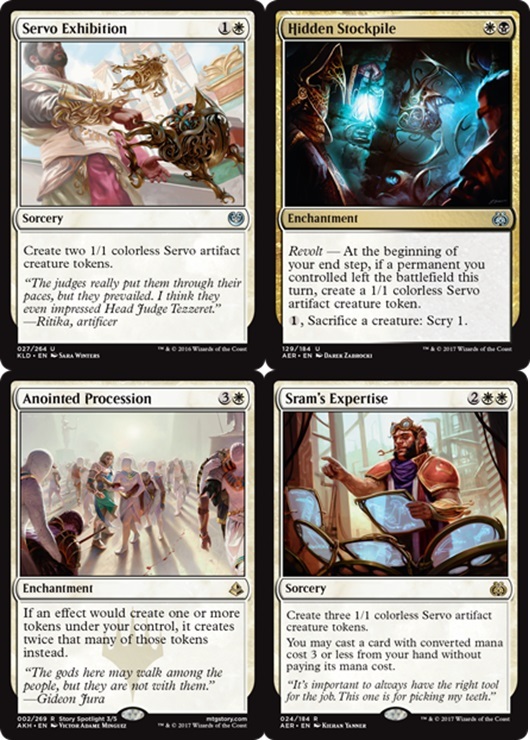 Examples again may be Servo Exhibition and Sram's Expertise coupled with Hidden Stockpile and Anointed Procession to double-down on token producing. Whichever way you may be charting your course, it is typically rather important to set yourself up a strong board presence upon which to build as early on in the game as possible. Another example used here is what one would love to see in an opening hand (or early card draws) should you be playing a Naya (white / green / red) Dinosaur decklist. Playing Imperial Lancer turn one immediately followed by Nest Robber just seems sublime as you look to land four damage on the second turn. As these two creatures become less relevant later game then you always have fodder for chump blockers. Likewise, as Dinosaurs are relatively a tich more mana intensive, consideration should be given to mana acceleration early game. Whether it is a 'man-dork' or a 'Banneret' (Morningtide reference) to reduce your mana cost. 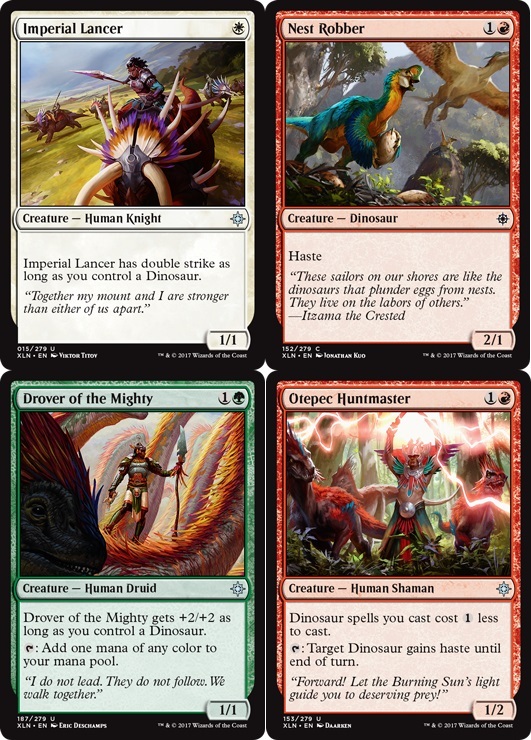 The example here may be having Drover of the Mighty come down turn turn (which is a lovely 3/3 should you already have a dinosaur out) to tap for any colour - and / or - have an Otepec Huntmaster reduce your dino overhead by one. The Huntmaster, also provides the benefit of sending a toothy hasty surprise over the fence. 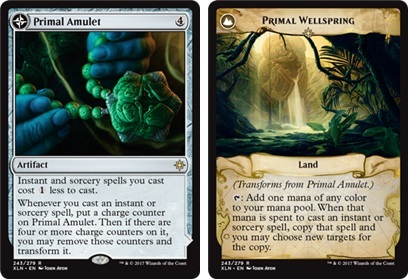 Again, building your list for synergy (whether tribal or no), should be provided equal weight in most cases with designing with your opening hand in mind. Happy Brewing Ixalan fans ! Deeproot Waters - a 2U enchantment which generates a 1/1 blue merfolk creature token with hexproof whenever you cast a merfolk spell. 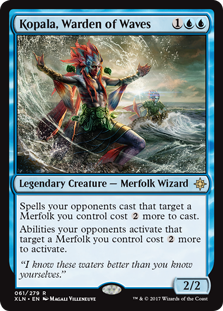 Kopala, Warden of Waves - 1UU legendary merfolk which forces your opponents to pay 2 more should they paint a target on one of your merfolk. Herald of Secret Streams - 3U merfolk warrior which grants an lovely unblockable abilities for your creatures with a +1/+1 counter on them. Other creatures from the two previous blocks not rotating out of standard may also assist - namely Metallic Mimic (to assist in getting those +1/+1 counters on), as well as Rishar, Peema Renegade (also brings +1/+1 counters to the party). 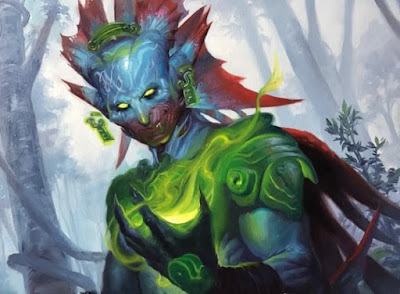 Although it is entirely too early to determine the success of a Blue / Green Merfolk build, it has given us enough promise of potential to forge ahead upstream with a list for the first few weeks of standard. Updated with today's Magic Story 'The Shapers'. For now however, we want to summarise a bit of Ixalan Fish Flavour for other merfolk fans. As we all know, Merfolk is a creature type for a race of aquatic humanoids, and although this race is centered on the color blue, they have also shown up in white in Lorwyn, black in Shadowmoor and now green in Ixalan. In fact, some Merfolk River Heralds of Ixalan are actually mono-green. Presently the Ixalan merfolk live a nomadic existence within the dense jungle. These Merfolk have a deep spiritual connection to nature, specifically the water and jungle are are able to 'shape' / animate and control both water and vegetation. Central to Merfolk spirituality is the Great River, Primal Wellspring and the Deeproot Tree. The merfolk of Ixalan are colorful and bright like tropical freshwater fish, and they use and wear jade jewelry, weapons and armor. There is an indication that jade may be embued with magic. 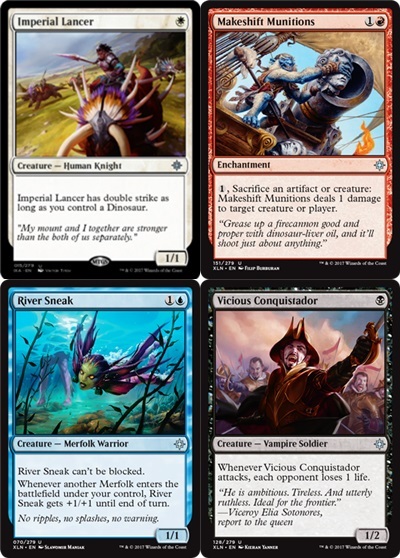 There are Nine Tributaries and Nine Merfolk Tribes, each led by a master Shaper, who take their name from the river as well as some of the characteristics of that waterway. From the Magic Story (The Shapers) we know that most Merfolk believe it is their duty to keep the golden city of Orazca and the Immortal Sun hidden from trespassers, although there is some dissension. 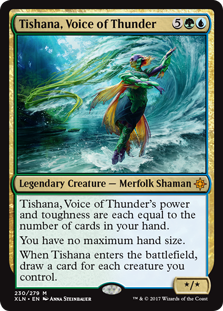 • Tishana, Voice of Thunder - the oldest among Merfolk Shapers who had instructed Kopala and other Shapers. • Kumena - a Merfolk Shaper. He is perhaps the most powerful among the nine Shapers, second only to Tishana. He believes the only way to keep his enemies at bay is to use the Immortal Sun relic. • Kopala, Warden of Waves - the youngest among the Merfolk Shapers. • Falani - nothing yet known. • Pashona - a Shaper with ability of foresight / future. • Tuvasa - a Shaper with ability to control air / flight. Here in Barrie, Ontario we are experiencing unseasonably warm weather and with a record breaking humidex of 37ºC (about 99ºF) today, I fear that when winter does arrive, there will be no ice on Georgian Bay and we will receive an unholy roof-collapsing volume of snow fall. Anywhoos, that is long off apparently - we should focus on the present. This weekend is the much anticipated Magic: the Gathering PreRelease for the newest set, Ixalan. The best way to enjoy this weekend if you find yourself in Central Ontario (an hour north of Toronto) is to attend one of many scheduled Ixalan PreRelease events over the course of the weekend at OMG! Games, conveniently located off Highway 400, near Georgian College in the City's North end. 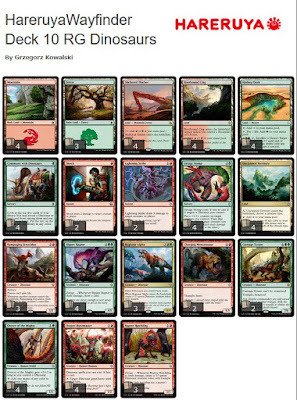 Expect air-conditioning, Pirates, Dinosaurs, Vampires, and Merfolk in this tribal-themed set. 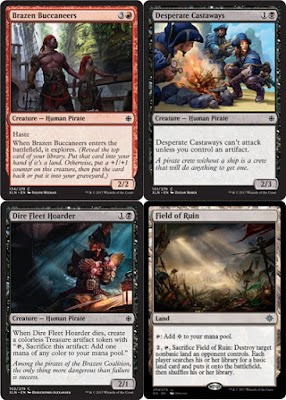 Here at MTG Realm, we do love PreRelease and the chance of pulling sweet rares, winning prizes and most importantly, having fun, but today we want to yatter about the upcoming Standard constructed season starting next weekend during Friday Night Magic. Over the last two weeks of official Ixalan previews, we have been imagining and contemplating the merits of a dozen 60-card decklists. Today is the day to see just how close we may have been in comparison to the MTG Professionals over at Hareruya. 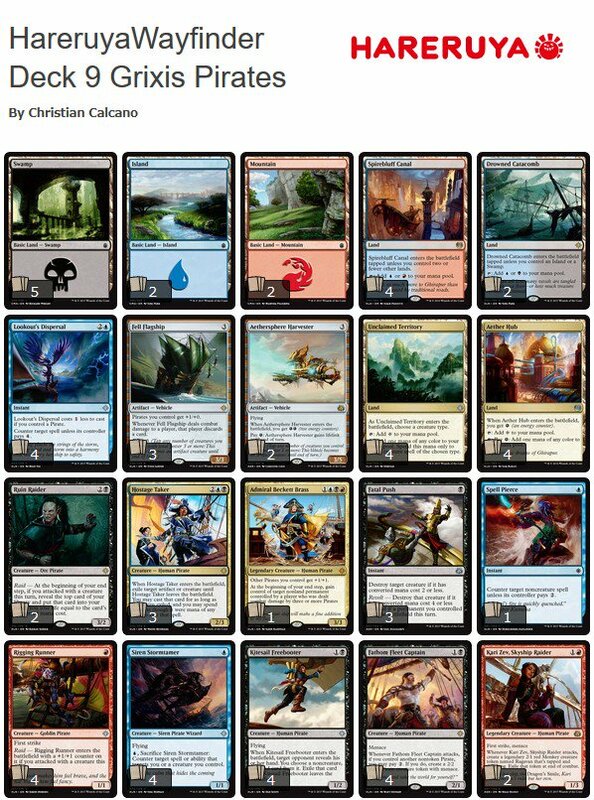 Here is this season's offering of innovative and exciting deck ideas - pop on over to this link for the full HareruyaWayfinder "Ixalan" edition from Kenji Tsumura and associates. Wednesday ! 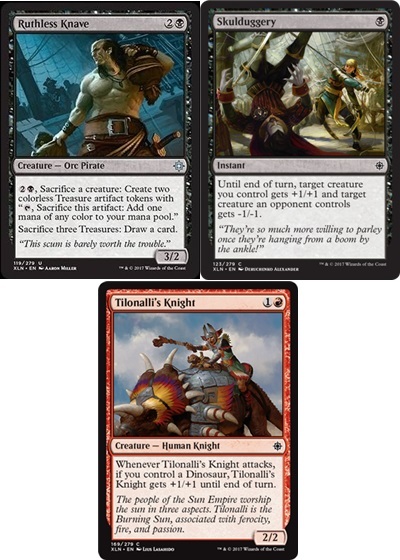 Always a treat when Wizards of the Coast publish the next Magic Story for a new set. To say we are giddy about the next Magic: the Gathering set Ixalan is a serious understatement. The stories certainly fuel our excitement for the set. 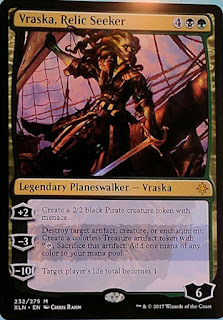 Please do slide on over to today's story titled 'The Talented Captain Vraska' by the R&D Narrative Team linked right over here. 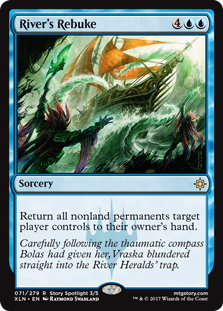 We definitely enjoy the story so far featuring amnesiac Jace, and finally learn what Vraska is doing the Plane of Ixalan. 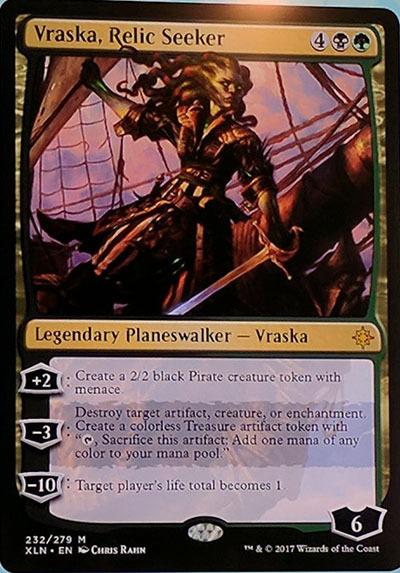 Also of great (flavour) importance to us - as Vraska's home Plane of Ravnica has no large sea worthy of a proper ship, just how did Vraska pick up those sailing skills ? Apparently if you are an Elder Dragon, you can transfer knowledge 'Matrix Style' - very cool ! 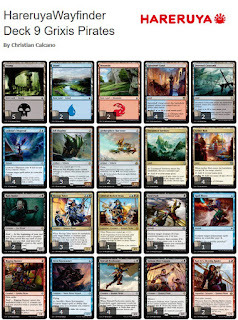 Anywhoos - out today on the mothersite are the Ixalan Planeswalker Deck Lists. These are great to quickly get into the game and be able to upgrade. For more details, pop on over here. 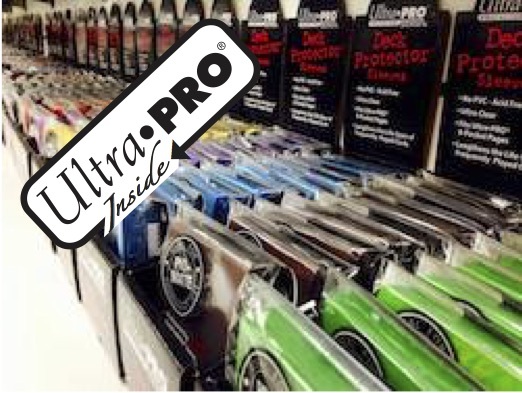 Get these sleeved and boxed up with some Ixalan deck protectors / deck boxes from Ultra PRO, and you are ready to rock a Friday Night Magic event at your local gaming store. Here is something that we are working on now for the new standard season for Ixalan - Merfolk Go Tall, this will certainly need some more work and evaluation. • Post-Ixalan Standard Constructed Merfolk. 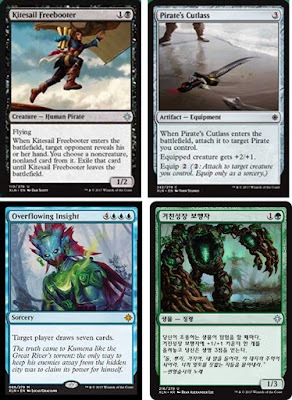 Go tall with +1/1 counters with Metallic Mimic, Vineshaper Mystic and Implement of Ferocity. 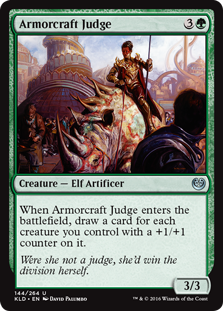 • Cash in with on those +1/+1 counters with Herald of Secret Streams and Armorcraft Judge. On Friday, concluding the official preview season, the full Ixalan card image gallery went live over on the mothersite. 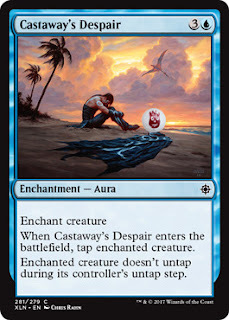 Since Friday, we here at MTG Realm, like many other gamers, we sequestered ourselves and went to the drawing board to create and develop ideas for standard constructed decklists. 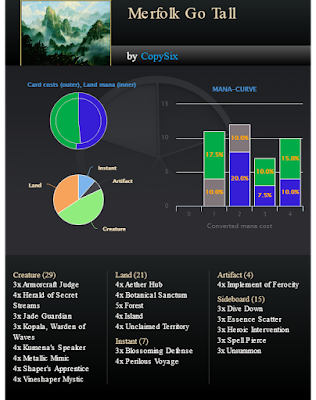 At the beginning of previous standard seasons, we would attempt to update an existing 'tried and true' decklist, but with 4 of the 8 Magic: the Gathering sets rotating out of standard, there was perhaps only two or so good lists not adversely affected. 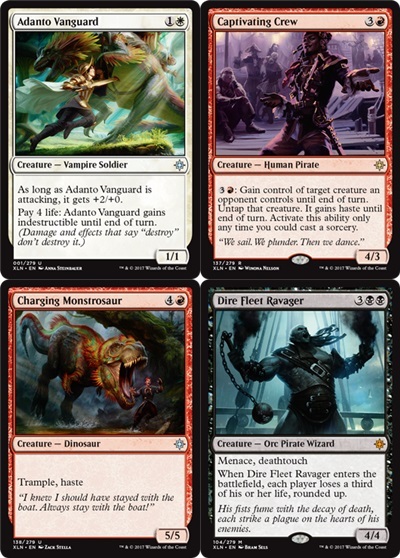 One suggestion is to build one of the 4 Ixalan tribes, but it appears that only Dinosaurs and Pirates presented strong enough options, with Merfolk and Vampires seeming weak, at least until improved support for those tribes are available in the next set, Rivals of Ixalan. 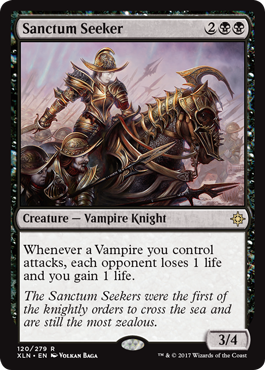 Early on in the previews, we were rather keen on Orzhov Black / White Vampires but were soon dissuaded from pursuing this. 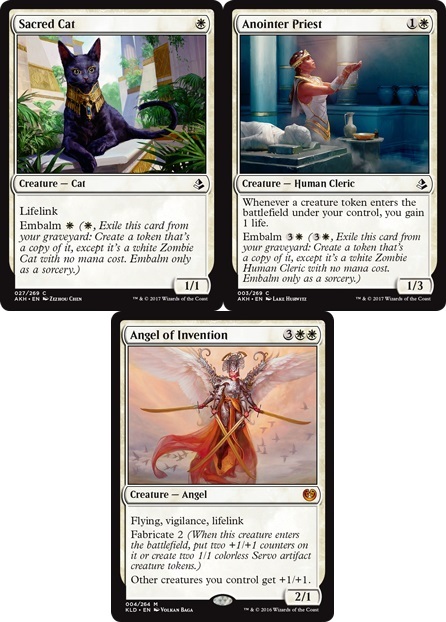 One of favourite decks of all time was a Black and White Token strategy during the original Innistrad block with Intangible Virtue (Creature tokens you control get +1/+1 and have vigilance) at its heart. 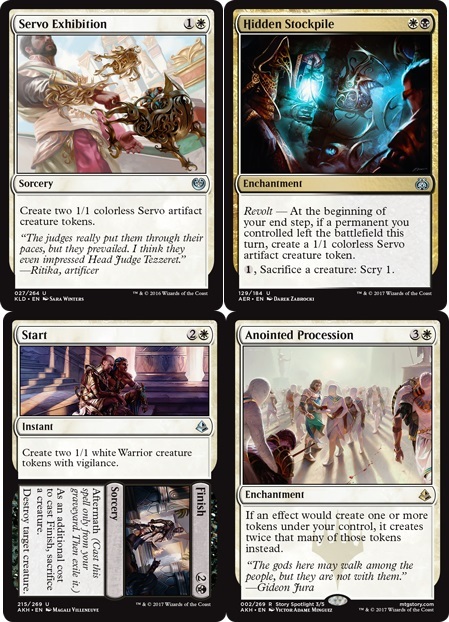 When Aether Revolt was released we attempted to mimic a black white token list again, with Hidden Stockpile and similar synergies and again with Amonkhet's Anointed Procession. 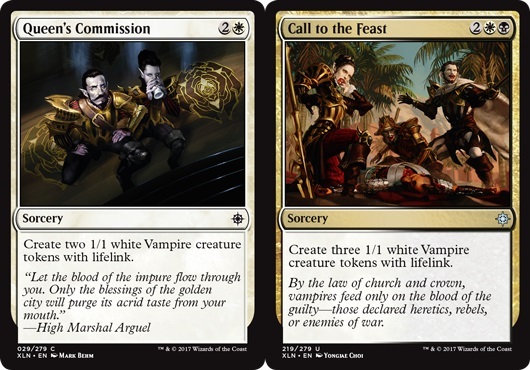 In Ixalan, we are now presented with another opportunity to attempt a similar strategy with the combination of Legion's Landing and Call to the Feast. With Anointed Procession and Hidden Stockpile still in standard constructed, is it enough to make this a serious consideration ? There is no good anthem effect available at this time, so perhaps a gain and drain scheme but having something as as epic as Cartel Aristocrat and Blood Artist at this time is looking slim. 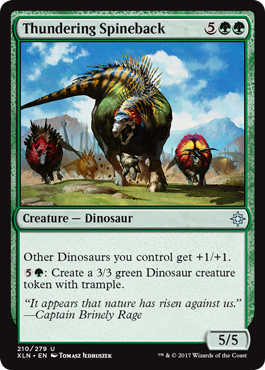 Perhaps we can hope for flooding the board early with tokens and dropping the opponent's life to critical before they land an incredibly large dinosaur. Since first reading the J.R.R. 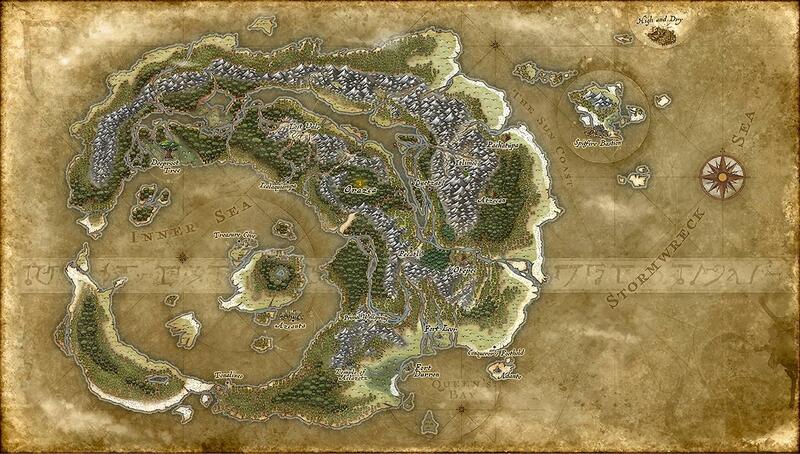 Tolkien's Hobbit at a young and impressionable age, I have had a liking for any fantasy novel which supplied a map. Tolkien's map of Middle-earth was referred to countless times as the book was read and re-read. While some world-builder's may hold the opinion that this sort of thing detracts from the story or restricts the reader's imagination, I have always found that a little cartography improves one's vision. Wizards of the Coast, although great map-makers on their Dungeons and Dragons side of the office wall, does not seem to approve of this on the Magic: the Gathering side. It was indeed a surprise that with the next set, Ixalan, that they are doing a slow-roll preview with a map of Ixalan. This perhaps was something the narrative team could not escape given the presence of Pirates, the search for treasure and a mythical lost city. Although the full reveal of the Ixalan Map (linked right here) is another week or two out from being fully revealed, MTG Realm has come across an image posted by Jim on Tumblr. More for our personal reference than you the reader - sorry to say, the full map and place names floated out from the Magic Story series are posted below. It is my intention to update details as things progress. Ixalan has at least two large continents that are separated by the sea. Further north, travelers meet only unmelting ice. For some reason, Planeswalkers can enter Ixalan, but can't leave. Ixalan, the western continent which bears the same name as the plane. Covered in vast jungles and rivers. It is home to large dinosaurs, that some of the natives managed to domesticate, and numerous secrets hidden within the forests. • Sun Coast, the eastern coast. 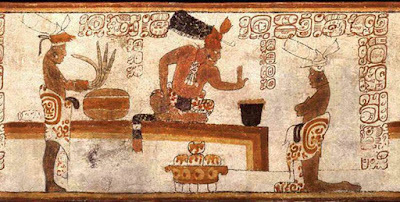 • Orazca, the lost city of gold. 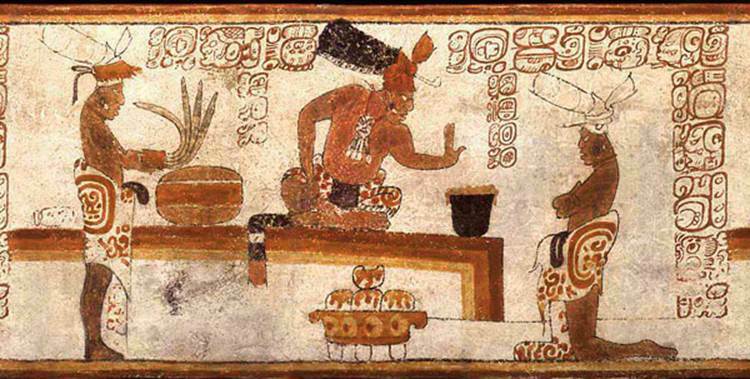 • Primal Wellspring, sacred springs infused with magical power. Torrezon is the name of the eastern continent. Ruled by an alliance between a powerful church and an iron-fisted monarch. Vampires dominate the continent after a series of wars with other realms. Refugees and exiles from the defeated nations fled to the sea and established the Brazen Coalition. Happy indeed as today marks the second Ixalan story posted to the mothersite. 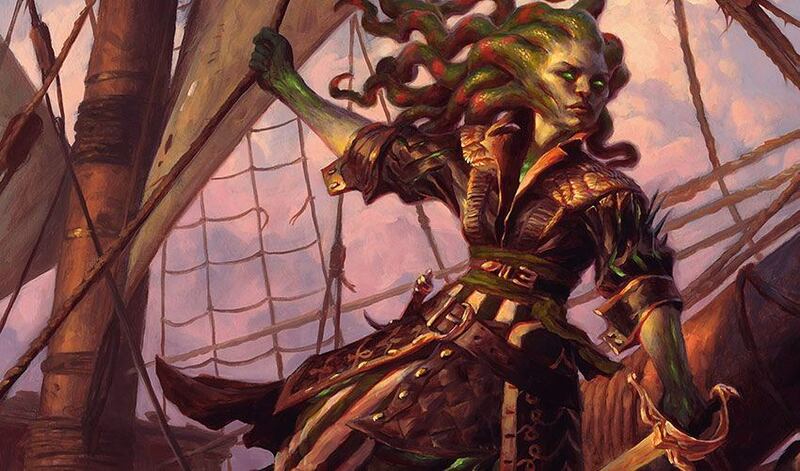 We suggest that before you look at today's Magic: the Gathering Ixalan previews, pop on over (linked right here) and read the story "A Question of Confidence' by the R&D Narrative Team. This may have been initially titled 'The Third Aspect of the Sun' however. The teaser for the story today - Huatli is a Warrior-Poet of the Sun Empire. Her talent in combat and creativity know no bounds, but when faced with a frightening encounter and an even more astounding vision, she must overcome discomfort to live up to expectation. Blake offered up an anticipated post of Ixalan tokens - and yes we're impressed with the great art again, and the clever linking of specific 'Treasure' token art to each tribe. Also of interest, Dan Barrett (@danisx0) WotC's Euro community staffer posted a FaceBook live stream as to what to expect for this weekend's Magic Open House event. Our local gaming store, OMG! 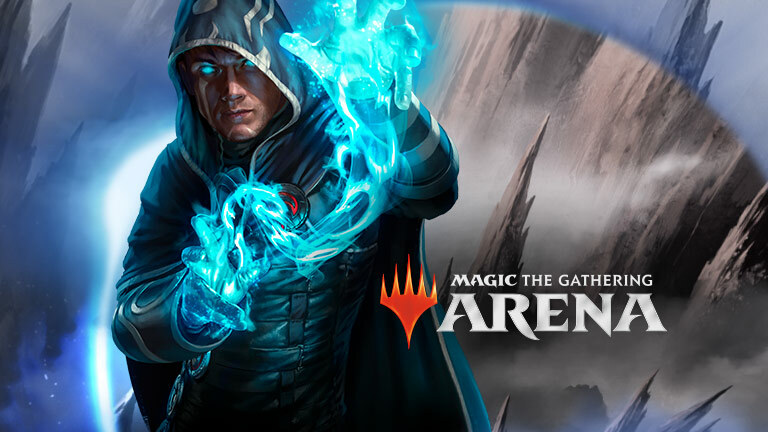 Games here in Barrie, is planning a great event to introduce new players to Magic: the Gathering. 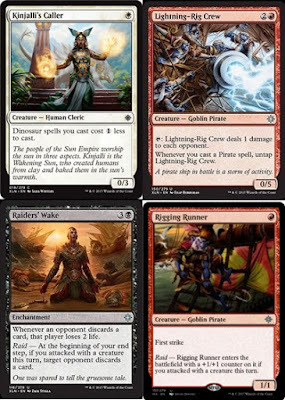 Here is is quick round-up of all the new Ixalan previews out so far today. 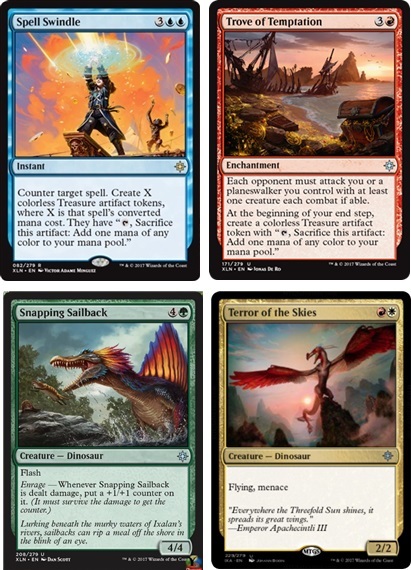 There are a number of new (and one previously spoiled / now officially confirmed) Ixalan cards out today. Before we get into into it, here is a brief summary of all the new Magic: the Gathering cards to be released into the wild at month's end. Righto, if you've been following the MTG Realm blog for a good stretch, you will most likely know we have a thingy for Tribal. This fondness may be a function of just when we came into the game - Lorwyn - a block which most definitively tribal in nature. We also do not count ourselves among good standard deck-builders and we admit that often we take an easy path by choosing a tribal 'Lord'. 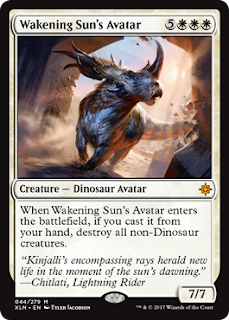 Specifically a card which provides an advantage to playing with the same creature type. Often this is basically a simple buff to power and toughness. • Dinosaurs - Thundering Spineback - Other Dinosaurs you control get +1/+1. 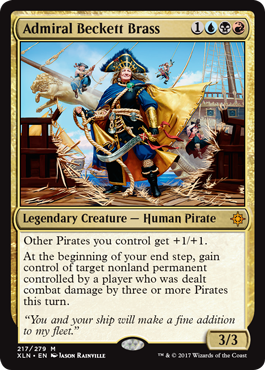 • Pirates - Admiral Beckett Brass - Other Pirates you control get +1/+1. • Arcane Adaptation - All will be one. This enchantment is a great equalizer. • Pillar of Origins - Mana rock to play any colour for the chosen creature type. • Vanquisher's Banner - Buff's P/T as will as given you a card draw - damn good. • Unclaimed Territory - same as the pillar, but in Land form. We are certainly excited about taking tribal for a spin in this set and are hoping for additional support cards forthcoming this week. We suggest that you may wish to Sam Stoddard's article today on the mothersite 'Developing a Tribal Set' to receive a better appreciation of some of the tricky and strategic work that Wizards of the Coast does to make tribal work in balanced and engaging game environment. Unfortunately, not so happy for some, either recovering from Hurricane Harvey, Hurricane Irma, or marking the 16th Anniversary of the tragic terror attack. Enough of that for now though as you are here for Magic: the Gathering news, spoilers, etc. Anywhoos, since brevity is the soul of wit, let me wear briefs. There is still some much Magic: the Gathering material to go through from the recent HASCON 2017 event. One big piece of news is that they were drafting Iconic Masters over the weekend, and OH MY, does this look fun. For the full list of all Iconic Masters cards coming out in November, pop on over to this link for the Iconic Masters Card Image Gallery. 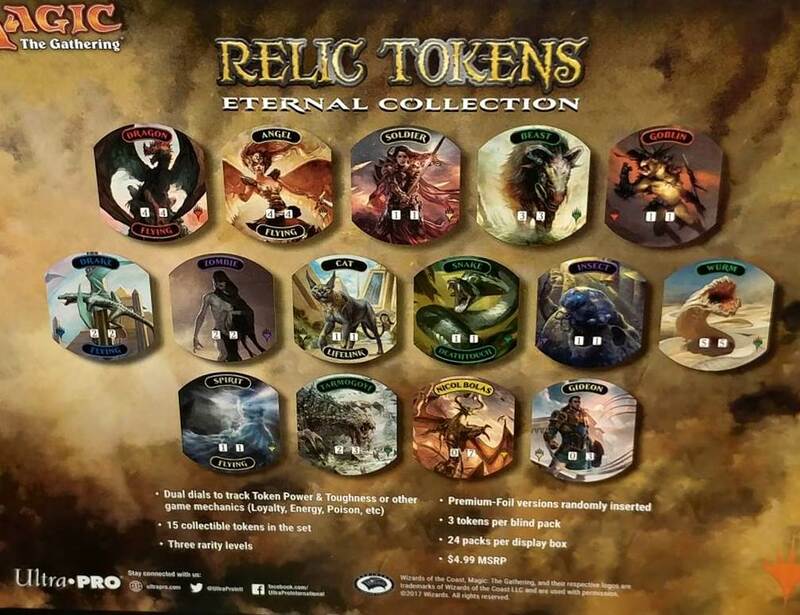 Relic Tokens available - Dragon, Angel, Soldier, Beast, Goblin, Drake, Zombie, Cat, Snake, Insect, Wurm, Spirit, Tarmogoyf, Nicol Bolas, Gideon. Tap: Add three mana of any one color to your mana pool. We’ve been under the weather since Wednesday but are now back in the saddle and have a lot of catching up to do with a large volume of Magic: the Gathering news and previews. Official Italian previews have finished off week one of two. The first Magic Story instalment, titled Jace, Alone is pretty much reminiscent of the true story of Chuck Noland, as played by Tom Hanks in Cast Away. Great opening story of how Jace, his mind broken by Nicole Bolas finds himself without his critical memory intact on the Plane of Ixalan and discovered by Vraska who has summarised the situation quite perfectly with the question "Jace, what the hell happened to you?”. Magic Arena is the next step being taken in Magic: the Gathering digital gaming. The previews out for this are also including a number of upcoming Ixalan previews as well. A number of very cool news and previews were revealed at HASCON. 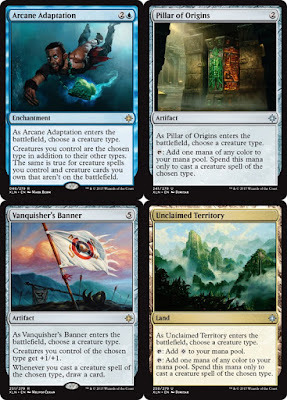 The mix includes cards as well as absolutely gorgeous full art borderless lands for Unstable. 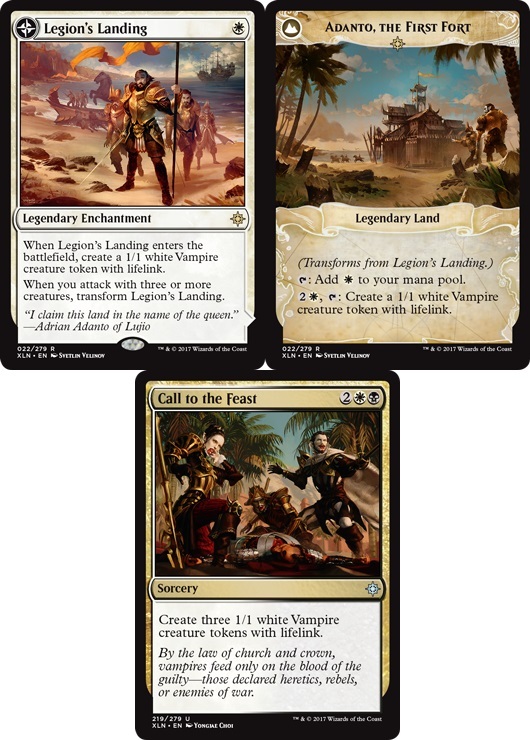 Other previews include Arena as mentioned above and some Ixalan previews. We cannot go through them all, so here is just the Planeswalker for now. We will fully catch up on Monday. 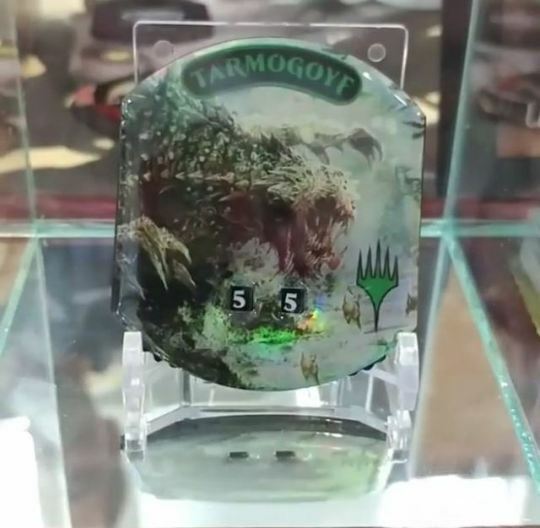 Previewed by Wizards of the Coast at HASCON. 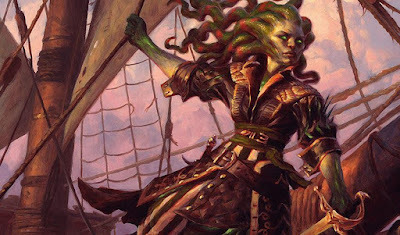 It is the start of the academic year for some and also the official kick-off of Magic: the Gathering previews for Ixalan. We already have had a number of previews from Wizards of the Coast already due to the alledged theft of that full sheet of rare Ixalan foils, so the schedule is very unfortunately mucked up a bit. 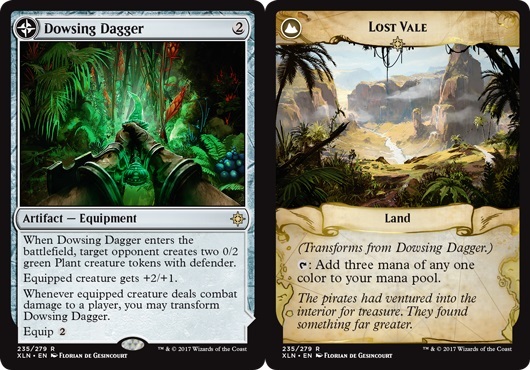 This certainly does not detract from our excitement however as the real treasure for us is when Wizards of the Coast introduces a new set is all about the storyline. Over the Labour Day Weekend, WotC Marisa Fulmer, Cynthia Sheppard, Jeremy Jarvis and James Wyatt hosted the Ixalan world-building panel at PAX West. This always seems to be the highlight of 'preview season' for us and this always amazes us just what an amazing job the creative team does in constructing the canvass and colour palette for all the new cards. Today's previews include some great cards and equally great illustrations from some very talented artists. 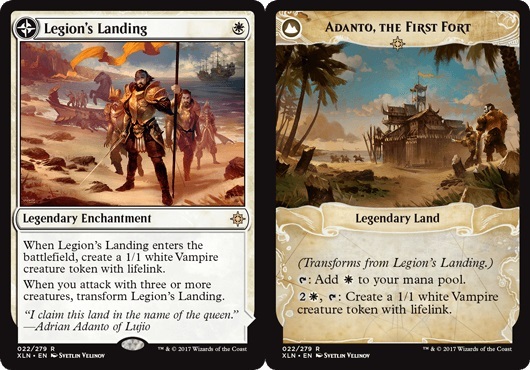 Be sure to check out Nicholas Wolfram's article on the Daily Article page which provides an indepth look at the card Conqueror's Galleon // Conqueror's Foothold, and the prompt provided by the Magic: the Gathering art team to artist Emrah Elmasli. In our opinion, Double-Faced cards provide the best vehicle in telling a set's story. 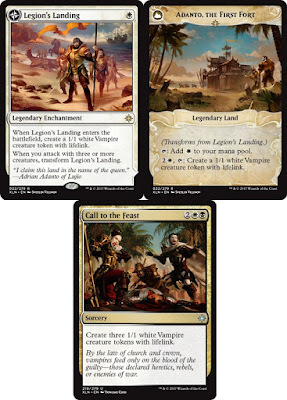 In this case, the story of the vampire nation's Legion of Dusk invasion of the continent of Ixalan.